Objective: To assess associations between baseline values of four different circulating markers of inflammation and future risk of coronary heart disease, potential triggers of systemic inflammation (such as persistent infection), and other markers of inflammation. Design: Nested case-control comparisons in a prospective, population based cohort. Setting: General practices in 18 towns in Britain. Participants: 506 men who died from coronary heart disease or had a non-fatal myocardial infarction and 1025 men who remained free of such disease until 1996 selected from 5661 men aged 40–59 years who provided blood samples in 1978-1980. Main outcome measures: Plasma concentrations of C reactive protein, serum amyloid A protein, and serum albumin and leucocyte count. Information on fatal and non-fatal coronary heart disease was obtained from medical records and death certificates. Results: Compared with men in the bottom third of baseline measurements of C reactive protein, men in the top third had an odds ratio for coronary heart disease of 2.13 (95% confidence interval 1.38 to 3.28) after age, town, smoking, vascular risk factors, and indicators of socioeconomic status were adjusted for. Similar adjusted odds ratios were 1.65 (1.07 to 2.55) for serum amyloid A protein; 1.12 (0.71 to 1.77) for leucocyte count; and 0.67 (0.43 to 1.04) for albumin. No strong associations were observed of these factors with Helicobacter pylori seropositivity, Chlamydia pneumoniae IgG titres, or plasma total homocysteine concentrations. Baseline values of the acute phase reactants were significantly associated with one another (P<0.0001), although the association between low serum albumin concentration and leucocyte count was weaker (P=0.08). Conclusion: In the context of results from other relevant studies these findings suggest that some inflammatory processes, unrelated to the chronic infections studied here, are likely to be involved in coronary heart disease. We report one of the largest and most prolonged prospective studies of “inflammatory” factors and coronary heart disease so far, with updated meta-analyses of previous relevant studies to put our findings in context. We measured four circulating markers of inflammation (C reactive protein, serum amyloid A protein, leucocyte count, and albumin10), which should help to determine whether there is some underlying process related to inflammation (rather than any one marker by itself) that might be relevant to disease. Most previous studies could not make such assessments because they typically reported on only one marker of inflammation. During 1978-80, 7735 men aged 40–59 (response rate 78%) were randomly selected from general practice registers in each of 24 British towns. Nurses administered questionnaires, made physical measurements, recorded an electrocardiogram, and, for 5661 men in 18 of the towns, collected non-fasting venous blood samples, which were stored at −20°C for subsequent analysis.11 Additional questionnaires on car ownership and childhood social circumstances (father's social class and childhood household amenities) were posted to participants five years (98% response among survivors) and 12 years (90% response among survivors) after entry. Laboratory workers blind to the case-control status of participants measured concentrations of C reactive protein and serum amyloid A protein using sensitive enzyme immunoassays. 4 5 The C reactive protein assay was standardised on the WHO international reference standard, and the results of the serum amyloid A protein assay were used to establish the WHO international reference standard for this protein.14 Albumin was measured with bromocresol green, and leucocyte counts were done with Coulter counters at the time of blood collection.11 The coefficients of variation within each of these assays was 2-4%; the variation between the assays was about 6-8%. Measurements were also made of concentrations of serum IgG antibodies to Helicobacter pylori (by enzyme linked immunoassay, Meridian Diagnostics, Cincinatti, Ohio), IgG antibodies to Chlamydia pneumoniae (whole organism antigen by time resolved fluorimetry15) and serum lipids, plasma homocysteine, glucose, insulin, and markers of renal function (by standard assays11). Case-control comparisons were made by unmatched stratified logistic regression fitted by unconditional maximum likelihood (Stata Corporation, Texas, USA). Analysis of concentrations of C reactive protein, serum amyloid A, and albumin and of leucocyte count was prespecified to be by thirds of values in the controls. Adjustment was made for age; cigarette smoking (never, former, current); daily cigarette consumption; non-fasting blood concentrations of total cholesterol, high density lipoprotein cholesterol, and triglycerides; current social class (registrar general's 1980 classification with separate category for armed forces11); housing tenure (owner, private rent, council rent); marital status; current car ownership; and father's occupation (manual, non-manual), family car ownership, bathroom in house, hot water tap in house, and bedroom sharing. H pylori seropositivity, C pneumoniae IgG titres, and concentrations of non-fasting blood lipids, plasma homocysteine, and other blood components were investigated as possible correlates of levels of each of the acute phase reactants. We have previously described the methods for meta-analyses of prospective studies of non-fatal myocardial infarction or death from coronary heart disease with over a year's follow up.2 The meta-analysis was updated to include all studies identified with data available in March 2000. Most studies related risk of coronary heart disease to baseline measurement of risk factors, even though the levels of each factor can fluctuate within individuals over time. Our comparisons of those in the top third of baseline values with those in the bottom third have therefore been corrected for such regression dilution16 by use of self-correlation coefficients derived from other studies.2 Results of studies were combined by using inverse variance weighted averages of log odds ratios. Heterogeneity was assessed by standard χ2 tests. Odds ratios are given with 95% confidence limits, and two sided probability values are used. The mean age at coronary heart disease event among cases was 62 years (mean duration of follow up 9.5 years). There were highly significant differences between cases and controls with respect to known vascular risk factors such as smoking, obesity, blood pressure, and blood lipids concentrations (table 1). In controls without evidence of coronary heart disease at baseline, the correlation coefficients of the associations between plasma C reactive protein and serum amyloid A protein, leucocyte count, and albumin were 0.58, 0.33, and −0.19 respectively (P<0.0001 for each), and the correlation coefficients between serum amyloid A protein and leucocyte count and albumin were 0.19 and 0.14 respectively (P<0.0001 for each). These associations among the four acute phase reactants were not adjusted for values of one another to avoid overadjustment since they may reflect a common underlying process (see tables on BMJ ‘s website). Leucocyte count and serum albumin concentration were not strongly related (R=−0.06, P=0.08). C reactive protein concentration was strongly associated with cigarette smoking, body mass index, and low forced expiratory volume in one second (P<0.0001 for each), and the associations were little changed by adjustments for age, town, smoking, and indicators of socioeconomic status. Associations of C reactive protein with high density lipoprotein cholesterol, triglyceride, urate, and insulin, however, weakened substantially after such adjustments (table A on BMJ ‘s website). There were strong and highly significant associations of serum amyloid A protein with body mass index and total cholesterol (P<0.0001) and with low forced expiratory volume (P<0.001) which remained significant after adjustment for possible confounders, but such adjustment substantially weakened the association with high density lipoprotein cholesterol (table B on website). Strong adjusted associations were observed between leucocyte count and cigarette smoking and packed cell volume (P<0.0001 for each, table C on website) and between low albumin and age and cigarette smoking (P<0.0001 for each, table D on website) and between albumin and blood pressure, total cholesterol, and packed cell volume (P<0.0001 for each). Possible associations existed between albumin and high density lipoprotein cholesterol, triglycerides, and serum markers of renal function. No consistent associations were observed of these acute phase proteins with H pylori seropositivity, C pneumoniae IgG titres, plasma total homocysteine concentrations, or a range of childhood or adult indicators of socioeconomic status. The odds ratio for coronary heart disease was 3.46 (95% confidence interval 2.59 to 4.62; χ2 =71, df=1) in men in the top third compared with those in the bottom third of baseline C reactive protein concentration (tertile cut offs, >2.4 v <0.9 mg/l). The odds ratio fell to 2.13 (1.38 to 3.28;χ2 =11.8, df=1) after smoking, vascular risk factors, and indicators of socioeconomic status were adjusted for (table 2). Comparisons between the top and bottom thirds of the other factors gave the following adjusted odds ratios for coronary heart disease: 1.65 (1.07 to 2.55) for serum amyloid A protein (>9 v <6 mg/l); 1.12 (0.71 to 1.77) for leucocyte count (>7.8 v 6.4×109/l); and 0.67 (0.43 to 1.04) for albumin (>46 v <44 g/l). These results were not materially changed in analyses restricted to the 329 cases and 820 controls with no evidence of coronary heart disease at baseline (table 2) or in analyses restricted to the 227 cases and 779 controls who had complete information on childhood socioeconomic status. The findings were also unaffected by varying the prespecified cut-off levels for analysis of each factor. Our prospective study in the general British male population shows that baseline values of four acute phase reactants are associated with one another as well as with future risk of coronary heart disease. These data support the idea that there are some underlying processes related to inflammation that are relevant to coronary heart disease. To determine what factor(s) might be triggering such low grade inflammation years in advance of disease, we studied classic risk factors, plasma homocysteine concentration, serological evidence of chronic infection with C pneumoniae or H pylori, and a range of possible other triggers. None, however, was strongly related to inflammatory markers, suggesting that these factors cannot fully account for the associations observed with coronary heart disease. Even though the strength of the association of coronary heart disease with baseline concentrations of C reactive protein and serum amyloid A protein seems comparable with that for some more extensively studied risk factors (such as blood fibrinogen concentration2), several uncertainties remain. We discuss below the strengths and limitations of the available evidence on coronary heart disease and each of these factors in the context of updated meta-analyses of other relevant studies. 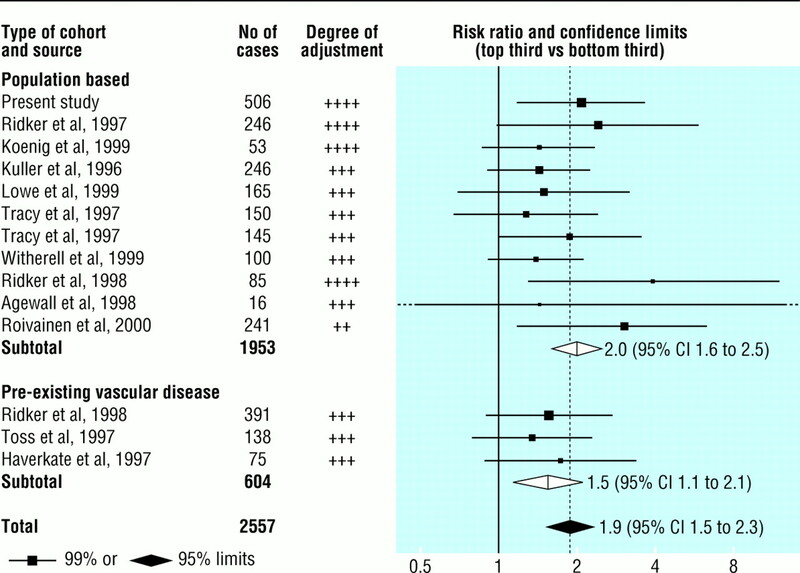 A previous meta-analysis of seven prospective studies of C reactive protein, with a total of 1053 cases, indicated a risk ratio for coronary heart disease of 1.7 (95% confidence interval 1.4 to 2.1) in individuals in the top third compared with those in the bottom third of baseline measurements.2 Since the publication of that review, six additional prospective studies of C reactive protein have been identified, including an additional 994 cases of non-fatal myocardial infarction or death from coronary heart disease.17–22 All used sensitive assays and adjusted for smoking and some standard vascular risk factors. In aggregate, the 14 available prospective reports (including the present study of 506 cases) include 2557 cases with a weighted mean age at entry of 58 and weighted mean follow up of eight years.17–28 There was no significant heterogeneity among them (χ2=6.9, df=13; P>0.1), and a comparison of individuals with C reactive protein concentrations in the top third with those in the bottom third at baseline gave a combined risk ratio of 1.9 for coronary heart disease (1.5 to 2.3; fig 1) with a similar risk ratio of 2.0 (1.6 to 2.5) in the 11 studies of the general population (test for heterogeneity, χ2=5.8, df=10; P>0.1). The estimated mean usual log C reactive protein values in the top third and bottom thirds were 0.38 and 0.02 mg/l in the general population, which correspond to mean estimated usual values of 2.4 and 1.0 mg/l. Hence, this updated meta-analysis indicates a similar risk ratio to the previous review, but the scope for the play of chance is now substantially reduced because there are more than twice as many cases reported. Only three previous studies have reported on serum amyloid A protein and incident coronary heart disease, 22 28 34 including two cohorts defined on the basis of pre-existing coronary heart disease. They comprised 551 cases in total (fig 2). Our 506 cases in the general population almost double the available evidence. In aggregate, these four studies include 1057 cases, with a weighted mean age at entry of 56 and weighted mean follow up of 10 years. There was no significant heterogeneity among them (χ2=0.3, df=3; P>0.1), and a comparison of individuals with values in the top third with those in the bottom third at baseline gave a combined risk ratio of 1.6 for coronary heart disease (1.1 to 2.2; fig 2). The estimated mean usual log values in these groups were 1.00 and 0.68 mg/l, which correspond to mean values of 10.0 and 4.7 mg/l. Further studies are needed to determine whether this association is independent of possible confounders. The adjusted odds ratio for coronary heart disease in our study was 1.12 (0.71 to 1.77) in men with leucocyte counts in the top third compared with those in the bottom third of baseline measurements. Although this odds ratio is not significant, it is consistent with a combined risk ratio for coronary heart disease of 1.4 (1.3 to 1.5) reported in a previous meta-analysis of 19 prospective studies of leucocyte count including a total of 7229 cases, with top and bottom thirds corresponding to mean usual leucocyte counts of 8.4 and 5.6×109/l, respectively.2 We also observed an adjusted odds ratio for coronary heart disease of 0.67 (0.43 to 1.04) in men in the top third compared with those in the bottom third of baseline albumin measurements. Again, despite a lack of conventional significance, this odds ratio is compatible with a combined risk ratio of 0.7 (0.6 to 0.8) reported in a meta-analysis of eight prospective studies including a total of 3770 cases, with top and bottom thirds corresponding to mean usual albumin concentrations of 42 and 38 g/l, respectively.2 The strongly positive associations of serum albumin values with blood pressure and serum lipid concentrations indicate that these variables cannot account for the association between low serum albumin and coronary heart disease—rather the reverse in fact. We found that baseline levels of four circulating markers of low grade inflammation were associated with one another and with future risk of coronary heart disease. The markers, however, were not associated with some chronic infective processes possibly related to coronary heart disease. These findings—in the context of results from other relevant studies—suggest that low grade inflammatory processes may be relevant to coronary heart disease. Contributors: The study was designed and conducted by the British Regional Heart Study collaborative group. All the named authors contributed to the analysis and interpretation of these data and to writing the paper. JD and PW are the guarantors. Funding The British Regional Heart Study is a British Heart Foundation research group and also receives support from the Department of Health. JD is supported by Merton College and the Frohlich Trust. MBP is supported by the UK Medical Research Council.